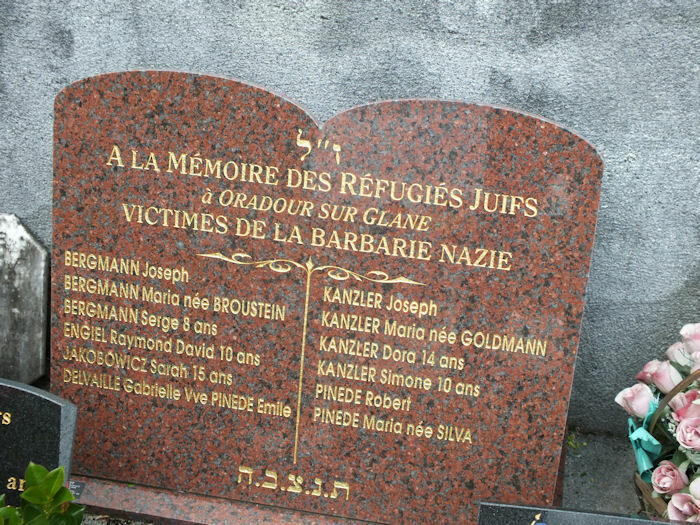 This memorial tablet to the twelve victims of the Jewish faith was dedicated on Sunday 27 June 2010 and stands on the left of the main memorial in the cemetery of Oradour-sur-Glane (under the first of the black memorial tablets). Note that all of the names are duplicated on the main memorials (and seven of them also appear on the memorial to the victims from Alsace). Whatever the motive for the massacre at Oradour, it seems certain that it was not an anti-Jewish operation, as none of the survivors has ever mentioned any interest being taken by the SS into the presence of Jews, or any attempt being made to identify them as such. Joseph Bergmann was the man who told Marcel Darthout whilst they were waiting in the Laudy barn, that they were going to be killed. Robert and Maria Pinède were the parents of the three Pinède children who escaped alive from the Avril Hotel. Sarah Jakobowicz probably was the third person to climb out of the window of the church after Madam Rouffanche (read Chapter 2 of In a Ruined State for more details). See also the special memorials to the victims from Alsace and from Charly (now Charly-Oradour).